Bennett Brinson Gamel: Fighting Cystic Fibrosis: NACFC 2015 - What was it like and what did I learn? NACFC 2015 - What was it like and what did I learn? There is way more information that came out of NACFC than I could easily share on my blog so I've decided to narrow my thoughts to the next three blog posts. But for those interested in learning more, I highly recommend checking out fellow CF mom Rebecca's blog for medical/science updates, watching the CF Foundation's recorded plenary sessions (probably the best part of the conference) Plenary 1 (future of personalized medicine), Plenary 2 (about clinical trials) and Plenary 3 (about mental health) and following on Twitter the hashtag #NACFC. 1.) What was NACFC like? The conference was big (~4000 people) but well-run. It was exciting to see so many people connected to a disease that affects so few. I heard that this year was even bigger with regard to outside interest in NACFC, as more and more companies are seeing pharmaceutical success with treating the disease. I had been warned that this conference was a medical conference and therefore might be above an average person's comprehension level. Although there were sessions "over my head" (or simply not interesting to me), most sessions were understandable and relevant to Bennett's care or to the care of other CF families I know. In general, there were parts of the conference that I thought were fantastic (like the plenaries, the pulmonary journal we received, the exhibit hall and many of the sessions). There were other parts that I thought were disappointing (some of the sessions could have been improved with regard to content and delivery). But, overall, I thought it was good. My favorite part, by far, was the opportunity to connect with people in the hallways and over meals. This picture is the first "Facebook CF Mamas" group gathering that I know of. 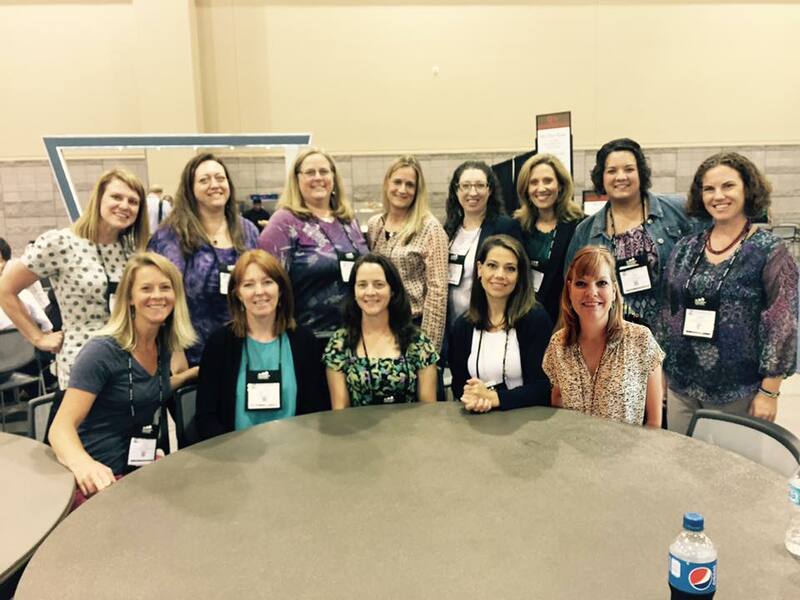 Out of the current 3,000 CF moms on the Facebook group "CF Mamas," 13 of us were able to find each other at NACFC to have lunch and say hello to each other "in real life." It was a really fun experience for us all as many of us have shared our stories and used each other as a resource online for many years now. Maybe this group will grow at NACFC next year. 2.) What did you learn at NACFC? The main thing I learned this year at NACFC is just how much more left we have to learn. For example, I went to a session on infection control, which I was excited to attend. But, when I left the session, I was only even more convinced that we have much to learn about our current infection control practices and how well they do (or don't) work. I went to a session on assessing for liver disease. But when I left the session, what I had gained was that researchers don't necessarily know what's best with regard to appropriately assessing liver disease. Researchers shared that there is little information on whether antibiotic treatment specifically targeting staphylococcus aureus results in clinical improvement. This still needs further study. It was discussed that biomarkers might help identify early CF lung disease. But that still needs to be studied. Research is being done on pulmonary exacerbations. But currently it's stated that "much of the current accepted treatment approaches to manage pulmonary exacerbations in CF lack quality evidence." For me, I think that before NACFC, I may have been under the impression that we already knew all of these things - well, that the researchers and clinicians did. I think that I falsely thought that I could just come to NACFC with open hands and the researchers/clinicians would rain down all of their information and insights so I could catch them. But, what I learned was that we are still a very ripe community for learning. Through some of my other patient advocacy work, I have learned over half of the clinical care that is given is not actually evidenced-based. What I learned at NACFC is that CF is is no exception. Care is given as it is known. But until something is studied and known for sure, it's simply a hypothesis. What I learned at NACFC is how many hypothesises exist and how much we still want (and need) to know. Ironically, there was a plenary at NACFC that addressed this very issue: the need for further studies. The plenary spoke about clinical trials and our need to enroll more patients in clinical trials so we can do more studies, not just with new meds but with current treatments so we can improve care. As we gain more information about how CF works and as we gain more capabilities to use biomarkers and more effective measuring tools such as MRIs to measure lung disease, the more we need to study to know why things work the way they do. Only then can we change clinical care to be more evidence-based. Nonetheless, I left a bit surprised that things are more complex than I had first imagined. It leaves me to wonder: how might CF patients and families better join forces with their CF healthcare providers to create evidenced-based clinical care sooner? 3.) 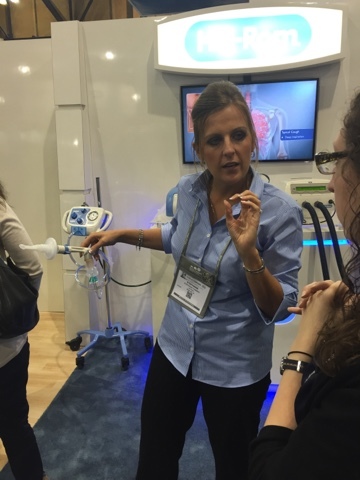 What new products did you learn about at NACFC? Ooh! I got to see a few really cool products coming out to the CF community!! I loved getting to see the tiniest new Hill-Rom Vest coming out soon! I love how it fits a baby doll! I don't know exactly what age this would benefit but Bennett started at 10 months with the size up from this one. So, I'd have to say this new size fits children even smaller. While at the exhibit hall, I was able to check out Hill-Rom's MetaNeb. It's not yet something that most people have at home but it may be in the next two years. It's supposed to help mobilize secretions in the lungs by using supplemental oxygen. Sounds complicated but looks like it could be amazing. The Hill-Rom rep, a CF mom herself, suggested we ask our hospitals if they have this device to use when we are inpatient if we'd like to try it out. I had a chance to see the new childsize AffloVest, which is for kids around 7+. I found it to be really easy but a little heavy considering the other vests are nothing but air. 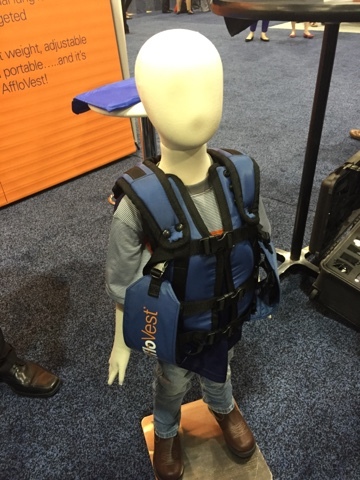 Since every percussion vest company was represented at NACFC, I had the opportunity to try on both an adult Hill-Rom Vest and AffloVest to see the difference. (I didn't look in to Respirtech since we don't own one. But I did see the new color vests they have now, which I love, btw.) I could feel what people talk about when they say the AffloVest and other Vests work differently. The Hill-Rom vibrates harder using air. The AffloVest is softer using vibrations. The say they are supposed to work the lungs differently. I couldn't feel how it best they benefit as I don't have CF. But, wearing them did give me better insight in to their benefits and disadvantages. Another product I saw but I don't have a picture of is the Aeroeclipse breath acuated nebulizer cup which can be placed together (as could any neb cup and mask) with the Aerobika oscillating PEP device. 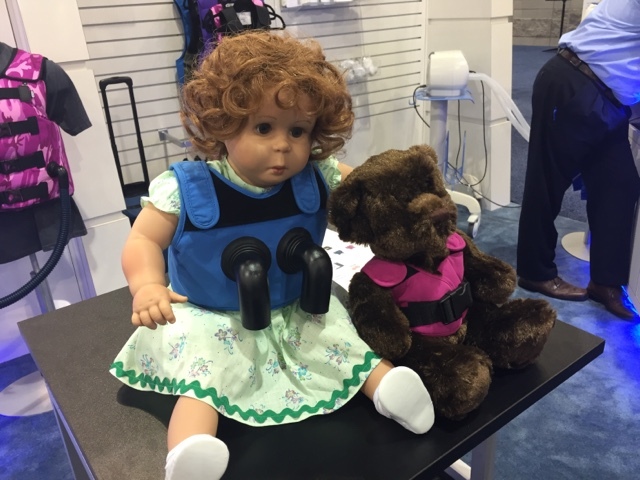 Bennett hasn't used either of these yet but from the conversations I had with the CF families I met, many are using and benefiting from PEP devices such as these. So, we will try it in the next few weeks. I hope to also speak more to our CF Clinic about their thoughts on these products. 4.) Would you recommend others to go to NACFC? Yes, I would recommend other CF families to go to NACFC. But, at this point, I also would say that anyone who is not able to go should not lose sleep over it. 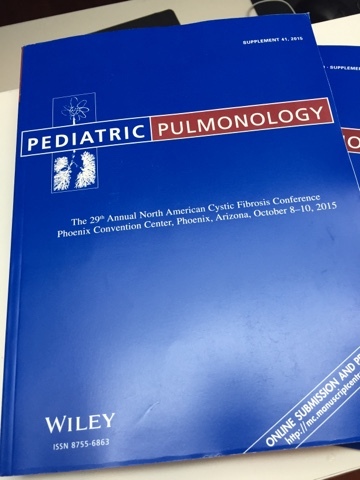 Currently, the best parts of NACFC are live streamed and the conference journal (Pediatric Pulmonology), which is fantastic, is available for free here. So, you don't have to go to get some of the best parts. The conference has a way to go before it would be considered "patient-centered." So, for people with CF and CF families to gain as much benefit as I think (and hope) they will eventually be able to do, it's likely got a few years to go yet. Nonetheless, I was glad I went and do recommend it to others. 5.) If you could change anything about NACFC, what would you change? 1.) I would like to see everyone encouraged to share what they are learning at NACFC on social media. NACFC offers important and valuable information to those in the audience and those not able to be. I'd love for in the CF community to have greater access to what goes on at NACFC. It would be really great to be encouraged throughout the conference to tweet thoughts and nuggets of info. Can you imagine if even half of the 4,000 clinicians and researchers regularly tweeted throughout NACFC? It would be an epic global conversation for all to enjoy! 2.) I would like for people with CF and/or CF parents to be given a real-time platform at NACFC to teach clinicians about their real life experiences of CF. Many medical conferences are beginning to recognize the power of including patients in their conferences. Although the CF community has challenges with cross-infection, involving CF families and people with CF (through the magic of technology) could have a profound impact on the kind of learning that happens at NACFC. 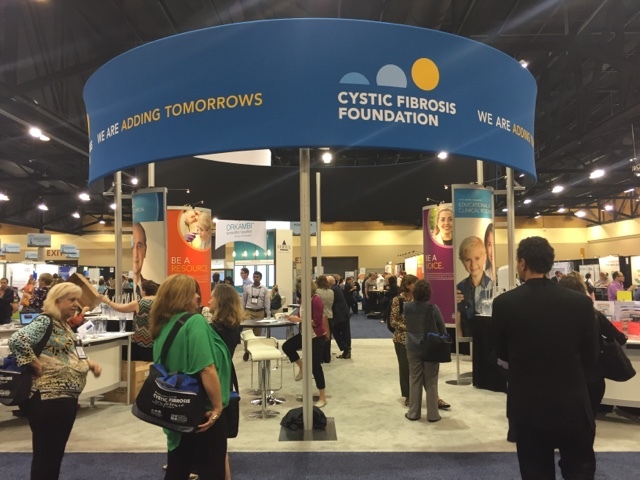 I believe involving people with CF and their families in the planning stages of NACFC is a great first step to moving towards patient-centered care in the CF community. Clinicians have a CF knowledge to teach us. But CF patients and their families have a different kind of knowledge to teach clinicians. I'd love to see that honored.